At the weekend we went to see Wonderful World of Disney on Ice at the Resorts World Arena Birmingham and we think it is the best Disney on Ice show yet! If you have been hesitating about whether to visit the show then I’d definitely recommend you don’t wait and you book tickets for this one. 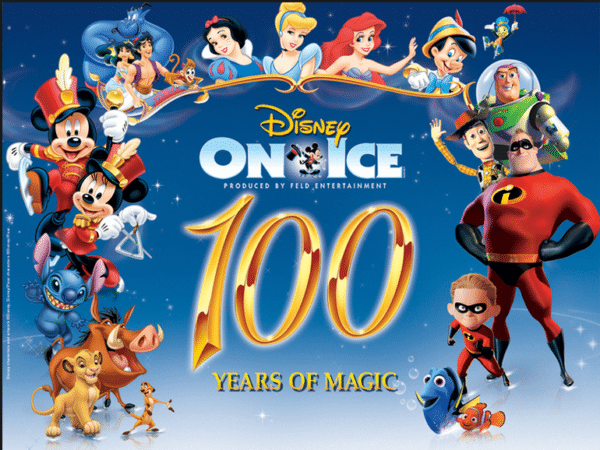 Disney on Ice plays twice a year in the UK and every time there is a slightly different combination of Disney stories. With the Wonderful World of Disney on Ice, you get more princesses to the pound. It is like a Greatest Hits of all the best bits of all the Disney on Ice shows over the yearsm with a few surprises thrown in. The best thing about Disney On Ice is getting to dress up as your favourite character. We love to look at all the different costumes. There are a lot of princesses but also a few Buzz Lightyears, a Peter Pan and a Mickey Mouse. The twins went as Belle and Merida this year. We went to the two thirty performance and it is worth noting that you need to get there really early. The queue going into Resorts World was really long so be prepared to wait. The main reason for this is there is only one entrance and everyone has to go through security. Also since we visited Resorts World Arena in January the car parking has now gone up to the astronomical price of £12. The ticket booths weren’t in operation when we were there but you can now pay online or as you leave if you have the correct change. The show starts with a fun routine from the Fit to Dance crew. We always love to see this after we took part in the Fit to Dance campaign with Ashley Banjo a couple of years ago. I love the way the show encourages children to be active. Once again the hosts of the show are our favourites Mickey and Minnie, joined by Donald and Goofy. They give some clues about what stories to expect in the show. Our favourite part of the show this year was The Lion King. The scenery really conjured up the African setting, with the burning orange sun and the distinctive lion rock in the centre. The dances were stunning, especially the poignant dance between Simba and Nala. The stunts in this section were incredible with Nala upside down at one point. We were blown away by the stampeding buffalo. I would never have imagined that a herd of buffalo could be portrayed on the ice, but it was really thrilling and scarily realistic. The next story was a big surprise as it didn’t feature on the posters. The story of Snow White is such a classic and we loved seeing the Seven Dwaves brought to life especially adorable Dopey. Other highlights included Under the Sea from The Little Mermaid, and my absolute favourite Disney on Ice scene, I See the Light from Tangled. This dance is so moving performed on the ice and there were real floating lanterns. One lucky audience member even got to launch a lantern with Rapunzel and Flynn Rider. The look on her face was priceless. We also loved the Aladdin sequence, complete with the palace at Agrabah. The procession of acrobats was really fun and there was even a giant elelphant. There was so much packed into the first half that we started to think that we had already watched the whole show and there was an interval. We were delighted that there was. There is lots of merchandise to buy in the interval. I’d recommend getting the candy floss as, although it costs an eye-watering £10 it comes with a Disney headdress in this case a gold crown complete with Mickey ears. It’s worth bringing wipes though as it is very sticky. In the interval, head back to the entrance where the queues for the toilet are much shorter, very important when you have young children. After the interval was Toy Story. We’d have liked to have seen more of the soldiers dancing to Toys are Back in Town and we were looking forward to hearing You’ve Got a Friend in Me. There was only a brief appearance from audience favourite Buzz Lightyear. In a show with so many stories, there does have to be a compromise somewhere. The introduction of Finding Dory was inspired. The costumes are wonderful especially the adorable baby Dory costume and the turtles. We really loved this heartwarming addition and it’s made us want to watch the film again. There is a definite sense the audience is waiting to see Frozen, it is still such a popular film. The Wonderful World of Disney on Ice gives a big chunk of time to Frozen and you get most of the story. There is falling snow, magical pyrotechnics and the familiar storyline of true love saving the day. Most of the audience is belting out every word of the songs and there is an audible cheer when Olaf arrives. It is the perfect end to an incredible show. You can catch The Wonderful World of Disney on Ice at Resorts World Arena until 7th April. Then find it in these Uk cities.